Ride with Mr. Monopoly and the Teutuls! 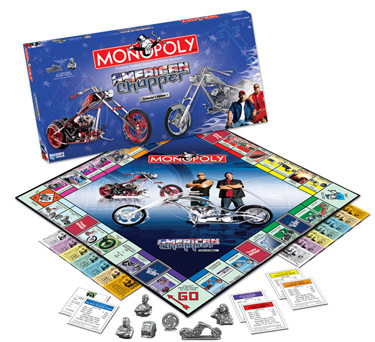 Itâ€™s pedal to the metal as this collectorâ€™s edition of the Monopoly game brings you all the tension, tirades, and triumphs - American Chopperâ„¢ style. Celebrate Discovery Channel's most watched series as you go full throttle as you buy, sell and trade the Teutulâ€™s most outrageous custom choppers. From the Black Widow Bike and Comanche Bike to the Jet Bike and POW/MIA Bike, relive the excitement and drama created by Paul Sr., Junior, Mikey and the entire OCC crew as they race to complete their one-of-a-kind choppers.